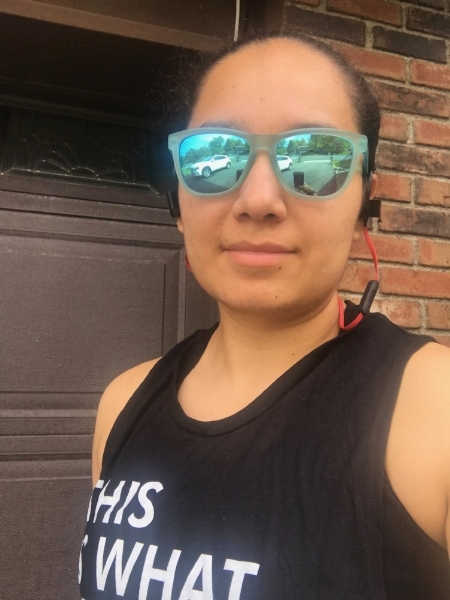 Our runner of the month is a fellow techie from New York. Lorena Vazquez started running casually with friends and realized her passion for it. For one of our coolest supporters, we're happy to share her story with you! I'm a software engineer in NYC. Love data and love sharing my passion for data with others and helping people gain insights from data. 2) Tell us more about your running history: how long have you been running? how did you get started? what motivated you? Do you race? I started running about 2 years ago. A friend of mine at work who is also a runner encouraged me to start. We started running along Battery Park. Fell in love with it and started challenging myself more and more. I've done a few 5ks but my goal this year is to do a 10k. My favorite thing to do is run through my neighborhood. I live around a lot of hills and it is rewarding to see how far I've come since I started. I'm no longer stopping or walking going up the steep hills. I can run them! I've always enjoyed listening to music. Weav Run changed the game for me because the music goes to the beat of my cadence. When I run with Weav Run, I feel like I can run farther, push through further, and have an amazing run. I Love it ft. Charli XCX (Icona Pop) . You can catch me signing out loud while I run. 1. Runners are amazing! At first I thought that people wouldn't run with me because I was slow. But, that is not the case. Every runner I have met has told me the same thing: It doesn't matter the pace, you are running. 3. Running is my stress reliever. When I'm having a really bad day, a run (no matter the length) lets out all the stress. Big shout out to Lorena for sharing her story with us. We hope to see you grow and improve with the rest of our community!